I.P.S.R. 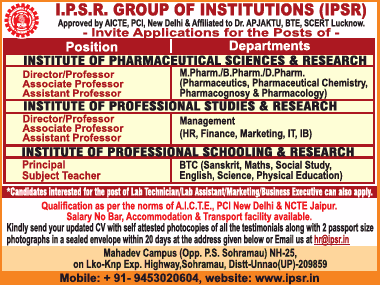 Group of Institutions, Unnao has advertised in THE TIMES OF INDIA newspaper for recruitment of Professor / Associate Professor / Assistant Professor / Director / Principal / Subject Teacher jobs vacancies. Interested and eligible job aspirants are requested to apply within 20 days from 13th February 2019. Check out further more details below. About College: IPSR group of Institutions was established on 26th October 2006 by Mr. Badri Vishal Tiwari is the Founder of Group with the zeal to provide the best education in the area of professional education. IPSR group of Institutions was established with intention of promoting high quality of professional education with its foremost sought after respective i.e. Pharmacy and Management with the effort of people who are expertise in their respective fields. Professional programmers are approved by AICTE , New Delhi, recognized by govt. of India and is affiliated to Dr. A.P.J. Abdul Kalam Technical University, Lucknow.